Anime-Lighthouse: Shinjitsu wa Itsumo Hitotsu !!! 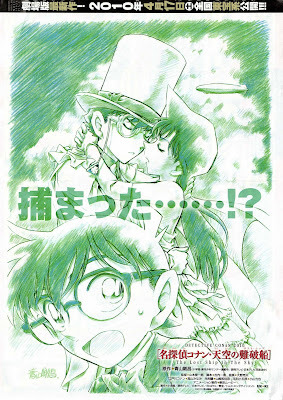 To all those who recognize this sentence, here's are the news of Detective Conan the 14th Movie. My most excited part is...............Kaitou 1412. Yep, is Kaitou KID, KID the phantom thief. Based on Wikipedia and trailer, the story is about airship. Suzuki Jirokichi, Sonoko's uncle, invites Mouri Kogoro, Ran, Conan and Shounen Tantei Dan (Genta, Mitsuhiko, Ayumi and Haibara) with Professor Agasa to ride the "Bell Tree" which is the largest airship in the world. Kaitou KID has his eyes set on the "Lady of The Sky", a jewel aboard the vessel. At the same time, a mysterious terrorist group known as Red Siamese Cat try to hijack the airship. What will happen to the airship? Will Conan and other save the airship from hijackers? Can Conan save the jewel from KID the magician? Will Jirokichi win against KID this time? Does KID means the jewel or Lady(Ran) of the sky? I've only seen one Detective Conan title, and that was the crossover special with Lupin III. Hello!!! Thank you very much. That crossover is just special episode. This is movie, you should check it out.